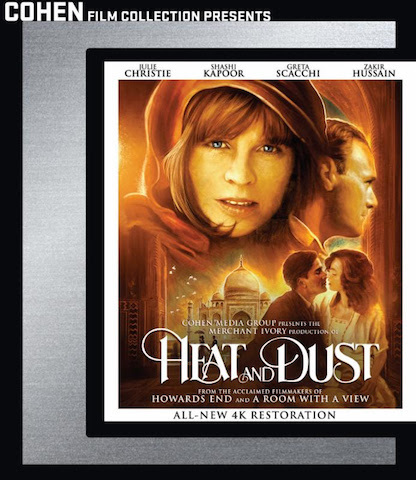 The 1983 multigenerational drama – about the clash between modern-day India and its past Raj era of British rule, and starring Julie Christie and Greta Scacchi – has received a striking new 4K digital restoration. Merchant Ivory’s magnificent film moves effortlessly between the vibrant world of modern India and the magnificent splendors of the Raj. Cross-cutting between two generations, the acclaimed film by the longtime team of director James Ivory, producer Ismail Merchant and screenwriter Ruth Prawer Jhabvala is a sprawling epic of self-discovery and a lush evocation of the prismatic and sensuous beauty of India. As she searches for answers to the mystery surrounding a long-ago affair between her aunt Olivia (Greta Scacchi, Presumed Innocent, The Player) and an Indian prince (cinema icon Shashi Kapoor), Anne (Julie Christie, Darling, Fahrenheit 451, Away From Her) becomes immersed in the local culture, the pull of the past simultaneously leading her into a clearer view of her own future. Jhabvala adapted her own novel to great effect, and Richard Robbins created the haunting score. The film earned the Merchant Ivory team nine BAFTA nominations and a Palme d’Or nomination at Cannes for director Ivory.